It was an artistic movement that brought together artists, thinkers and researchers. They were involved in a hunt of sense of expression of the unconscious. They were searching for the definition of a new aesthetic, new humankind, and new social order. 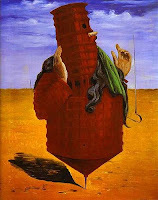 Their forerunners were the Italian Metaphysical painters, mainly Giorgio de Chirico, and they also received the influence of the Symbolism and Dadaism. It came into being after the French poet Andre Breton 1 published Manifeste du Surrealisme. Breton suggested that rational thought was repressive to the powers of creativity and imagination and thus inimical to artistic expression. He admired Freud and its concept of the subconscious. It is closely related to some forms of abstract art. At the end of World War I Tristan Tzara, leader of the Dada, wanted to attack society through scandal.He believed that society that creates the monstrosity of war do not deserve art so he decided to create an anti-art, full of ugliness instead of beauty. Tzara wanted to offend the new industrial commercial world of the bourgeoisie. His victims did not feel insulted. They saw this art as a reaction against old art. The result was the opposite to its original one because anti-art became art. One group of artists did not follow Tzara´s ideas. 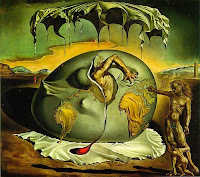 The Surrealist movement gained momentum after the Dadá. It was led by Breton. The artists researched and studied the work of Freud and Jung. Some of the artists expressed themselves in the abstract tradition while others used the symbolic tradition. 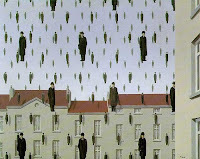 The two forms of expression formed two distinct trends: automatism and veristic surrealism. Artists interpreted it as referring to a suppression of consciousness in favour of the subconscious. They were more focused on feeling and less analytical. They understood Automatism as the automatic way in which the images of the subconscious reach the conscience. They believed that images should not be burdened with meaning. They saw the academic discipline of art as intolerant of the free expression of feeling. They felt form which had dominated the history of art, was a culprit in that intolerance. They believed abstractionism was the only way to bring to life the images of the subconscious. Coming from the Dada tradition, these artists linked scandal, insult and irreverence toward the elite’s freedom. They continued to believe that lack of form was a way to rebel against them. They interpreted automatism to mean allowing the images of the subconscious to surface undisturbed so that their meaning could be deciphered through analysis. They wanted to faithfully represent these images as a link between the abstract spiritual realities and the real forms of the material world. To them the object stood as a metaphor for an inner reality. Through metaphor the concrete world could be understood, not only by looking at the objects, but also by looking into them. They saw academic discipline and form as the means to represent the images of the subconscious with veracity. The images would easily dissolve into the unknown. They hoped to find a way to follow the images of the subconscious until the conscience could understand their meaning. The language of the subconscious is the image. The consciousness had to learn to decode that language so it could translate it into its own language of words. Later they branched out into three other groups. In the works of surrealist we find the legacy of Bosch, Brueguel, William Blake and the symbolic painters of the 19th century, in addition to the perennial questioning of philosophy, the search of psychology and the spirit of mysticism. It is a work based on the desire to permit the forces that created the world to illuminate our vision. They must allow us to consciously develop our human potential. It was highly influenced by the psychoanalysis: images are as confusing and startling as those of dreams and can have a realistic, though irrational style, precisely describing dreamlike fantasies. 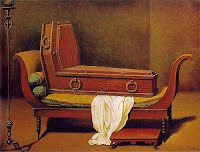 Sometimes they invented spontaneous techniques, modelled upon the psychotherapeutic procedure of free association as a means to eliminate conscious control in order to express the working of the unconscious mind, such as exquisite corpse. Some of the representatives of this movement are: Marx Ernst, Frida Kahlo, Marc Chagall, Joan Miró, Man Ray, Salvador Dalí, René Magritte, Yves Tanguy, Oscar Dominguez. He reached to the deepest critic of the form as a depiction and the style as something unitary. He used any technique that would be useful for transmitting his ideas. He used collage and frottage. His work is frequently a pile of rubbish of bourgeois culture. He used symbolic keys to depict the unconscious. His principle is not the organic world. His world is simple, clear. His mythology is easy, transparent. His painting is unstressed, freely chromatic, without equilibrium among signs and colours . He was previously involved in the Dadaism. He depicted organic forms, both in painting and sculpture. He used geometric shapes, orthogonal images and continuously curve forms, concave and convex. He invented the anti-Nature with never ending landscapes, planet like settings, lack of light and sun and remains of organic life such as bones, mummified fruits, fossils and shells. His view is full of sexual connotations and his works are highly rhetorical, with a mix of lubricous and holy. He overcame cynically the bolshevism. He represent an ambiguous mix of reaction and anarchy. His compositions are very complicated. He is the artist who worked in a deepest way the lack of logic of the image. He invented the anti-history. He discovered the non-sense of the normal. He created with great detail and realism images of ambiguous significance that could have a double sense. 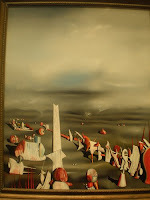 Other artist contributed to the expansion of the Surrealism, equally in Europe and in the United States. Soon it appeared as a way of eluding the reality of the problems through ambiguity and paradox. The movement gained prestige with the adhesion of artists such as Picasso. The analytical cubism, discomposing the objects did a similar work as that of the Surrealism.